Most switchboards and motor control centres are ﬁtted with a variety of electrical and mechanical safety interlocking devices. Withdrawing the switching device while it is carrying load or fault current. Prevent the switching mechanism from being inserted when it is in its ‘on’ state. Opening of access doors or panels before setting the switching device in its ‘off’ state. Gaining physical access by human operators while the main conductors and contacts are energised. Gaining access to the busbars when the switching devices have been withdrawn. To prevent earthing switches from being closed on to live circuits or busbars. Incorrect electrical operation of a complex process system in which various external devices, motors, pumps, etc. are intimately related. For example a lubrication oil pump must be running before the main drive motor is started on a pump or compressor. Most of the above interlocks are mechanical latches, bolts and shutters. The last category is electrical functions using wired relays or electronic logic. 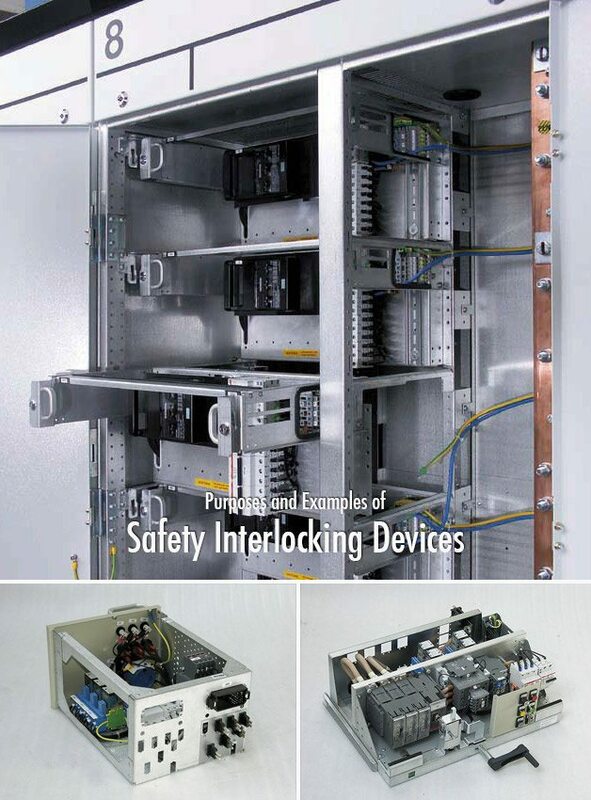 Electrical interlocking is also used to ensure that certain closing and tripping functions take place in a particular sequence. Energising a downstream switchboard is done through a transformer or plain interconnector. The upstream switching device is closed ﬁrst. The downstream device is then closed. If either trips on fault then the other may be caused to trip by auxiliary circuits and relays. ‘Two-out-of-three paralleling’ is a term used when a switchboard has two parallel feeders. It is the term given to a particular closing scheme applied to the two incoming and the busbar section circuit breaker. The feeders are usually transformers. The purpose of the scheme is to enable a no-break transfer of the feeders to take place, and to minimise the duration of a prospectively high fault level that may exist during the transfer. Auxiliary switches are ﬁtted within the three circuit breakers to determine when all three are closed. As soon as the third circuit breaker is closed the fault level at the busbars will in most cases be too high, and a signal is then given to one of the circuit breakers to trip. A selector switch is sometimes used to choose which of the three will trip. Some installations use a timer relay to delay the automatic tripping action, and the time delay setting is typically 0.5 to 2.0 seconds. This scheme is not used for all dual feeder switchboards, but is common practice with low voltage switchboards. The ﬁrst method uses auxiliary switches on the upstream circuit breakers, usually the busbar section circuit breakers. These auxiliary switches give a signal that its circuit breaker is open, thereby signalling that an unsynchronised supply will exist at the downstream location. The signal is used to prevent the three downstream circuit breakers being closed all at the same time, i.e. the ‘two-out-of-three paralleling’ scheme is inhibited from closing its third circuit breaker. 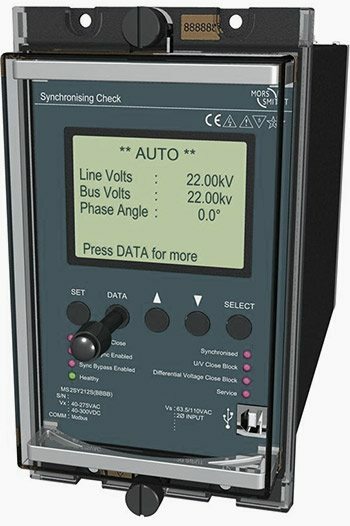 The second method is popular and uses a ‘synchronising check’ relay (25) to sense the voltage on both sides of a circuit breaker. For the above mentioned dual incomer switchboard all three circuit breakers would be equipped with the synchronising check relays. This is a beautiful site. I am loving it.